Wade and Eliza were through. The love was gone and the fighting was non-stop. Desperate as they were to get away from each other neither of them was ready for how they would finally part. The death with a thousand faces had reached up from the Downs to harvest yet another victim. Heart broken and driven by revenge one of them would come face to face with the otherworldly terrors lurking in the Downs and eye to eye with the remorseless Black Betty. 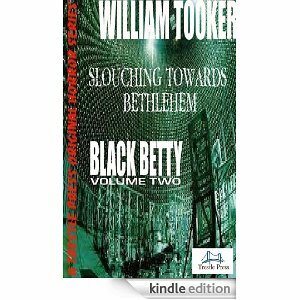 A dark horror tale by William Tooker. The sinister town of Veil mentioned in his previous story Bad Angels features in this dark tale. It’s difficult to discuss the start without giving anything away. However, I’ll say that a young couple has an argument and a car journey from which one of them will not return. Gnats swarmed in clouds everywhere humming a chorus that sounded like distant whispers. A fallen crystal chandelier looked like the mummified remains of an ancient crystal snowflake beneath the dust on the floor. All in all a great story well told. The tension is excellently build up and just when you think it can’t get any darker you are plunged head first into the abyss. Great stuff from Mr. Tooker.